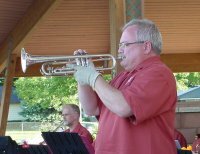 Brio Brass has delighted and entertained audiences throughout Minnesota's Twin Cities Metro area since 1999. Formed of over 50 adult musicians, Brio Brass is a non-traditional, rockin' brass band! Members of the ensemble bring a wealth of experience and talent to their unique performances. The skillful selection of music, lively pacing, added surprises, combined with a relaxed atmosphere appeals to all types of audiences and age groups. There promises to be lots of humming, toe tapping and even dancing in the aisles. Brio Brass performs their own unique arrangements written specifically for its members. Their large repertoire features a broad spectrum of musical styles. Audiences are entertained with fluid ballads, pop of all eras, show tunes, funky rock and LOTS of JAZZ! Copyright © 1999-2015 by Free Taco Enterprises, All Rights Reserved.